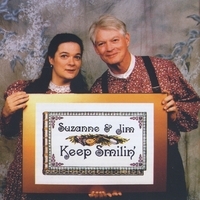 In their debut recording, Keep Smilin' , Suzanne and Jim present a dozen selections of Old Timey music. From carefully crafted duets to an a cappella song; from powerful clawhammer banjo instrumentals to a 19th century shape note hymn; from light- hearted humor to a murder ballad this CD has something appealing to a wide variety of tastes. One tune even features Suzanne's clogging as rhythm accompaniment. The performance was recorded head-on with no over dubs and no guest musicians to build up the sound. The music was mixed to blend the voices and the instruments together, re-creating the flavor of recordings from the golden era of Old Time music - the 1920's and 1930's. Here are two singers and their instruments, clearly having fun and capturing the excitement of a live performance. From the opening instrumental (with a few off mic barn dance calls) to the final hymn, Suzanne and Jim have brought their fresh energy to Old Timey music. WOW, love the banjo pickin! I was toe-tapping my feet away while at work, listening to the CD. Some of the songs, I was not familiar with at all. I truly enjoyed the music; makes me wish I had stayed with learning the piano or another musical instrument. I shared my new CD with my brother-in-law who is an acoustic guitar player and teacher. I am anxious to hear what he thinks of the CD. When will there be another release?